Myriam Gourfink, Breathing Monster, image: courtesy of Myriam Gourfink. From one of Europe’s leading choreographers Myriam Gourfink and acclaimed Polish-French composer Kasper Toeplitz comes Breathing Monster, a synthesis of hypnotic sound and uncanny physical movement. A woman gently glides through a long, narrow, invisible maze creating a series of micro-movements in extreme slow motion. As her body propels forward with the stillness of time itself, it gathers incredible momentum, and her gestures become a gravity-defying feat. With prodigious precision, her bodily contortions alter the surrounding musical landscape, breathing new meaning into everything that we see, hear and feel. Blending live music, motion-sensing technology and extreme physicality, Gourfink and Toeplitz design a suspenseful journey through the void, where a Breathing Monster emerges in a wonderfully original narrative about abstraction, time and space. 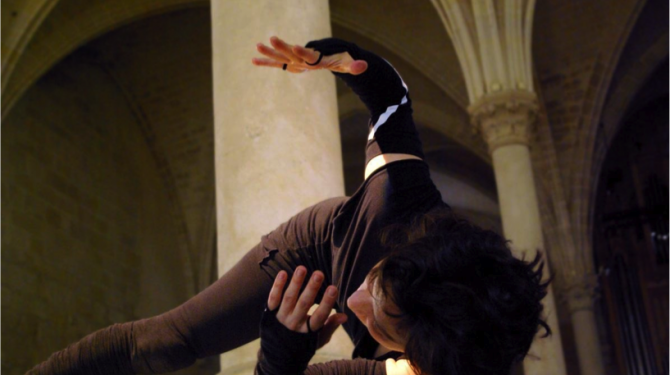 Created and Performed by Myriam Gourfink (dance choreography) and Kasper Toeplitz (electric bass). Presented by Performance Space and National Art School in partnership with Critical Path and Dancehouse for ISEA2013. Loldanse is underwritten by Direction Régionale des Affaires Culturelles, Ministry of Culture and Communication, and represented by Julie George & Damien Valette. Performance runs for 50 mins from 8pm, Friday to Sunday.